South Africa has a rich historical, cultural and natural offering for those who have the time to explore its multifaceted attractions at leisure. UNESCO is part of the United Nations and proclaims some areas or attractions to be World Heritage Sites based on their intrinsic value (depending on a variety of factors). The same standards and requirements apply, no matter where in the world the destination is situated. South Africa is the proud home of a number of UNESCO World Heritage Sites, which continue to delight young and old, and to add value to the natural, economic or historical wealth of this land. Boasting so many Heritage Sites places South Africa on a global platform for tourists seeking a very special destination. Situated in Sterkfontein, this is believed by some scientists and historians to be the Cradle of Mankind; the very origin of human beings as we know them today. Some of these fossils are dated at 3.3 million years old. This attraction is well-equipped for the many tourists that frequent it every year. This scenic desert is situated in the Northern Cape Province and is cared for by the local community. It is home to a semi-nomadic farming community of Namaqua folk, who continue to live off the produce of the land. It is hauntingly beautiful here, promising spectacular photographs. This well-known attraction is notorious for having been home to the prison that held former President Nelson Mandela and a number of other respected political prisoners for decades during the Apartheid regime. The empty prison is now a museum. Ferries depart from the V & A Waterfront to Robben Island several times a day to conduct tours on the island. This unique area, nestled within the Western Cape, is home to almost one-fifth of the continent’s plant life. There are eight individual protected areas within it and it boasts one of the most abundant plant arrays in the world. This, of course, means that there is also a range of animal species that take advantage of this beautiful area as their natural habitat, particularly birds. Dating back to the palaeoproterozoic era, this crater is acclaimed for being the oldest, deepest and most eroded astrobleme (or star wound) on the planet. In fact, it is believed to be some two billion years old. 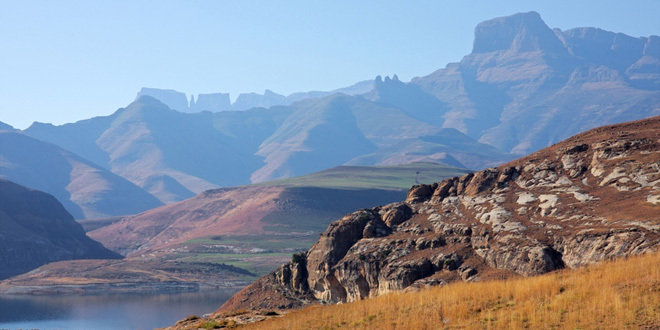 The uKhahlamba Drakensberg Park, also known as the Drakensberg Park, this is a wonderland of valuable basalt, sandstone, grasslands that lie at extraordinarily high altitudes, river valleys and rocky gorges. It is situated in KwaZulu-Natal and continues to attract tourists from all over the world. Still a few on this list that I need to visit. Robben Island is a great experience. Robben Island is fantastic and definitely worth the visit. I would love to see the Vredefort dome!